Working together, let's end hunger in Hall County, Georgia! Thank you for visiting our site. We look forward to sharing our home with you. A home is a special place comprised of special people. Ours is filled with Sponsors, Board Members, Volunteers, Partners, Donors, Affiliates, Grantors, and most especially, our Clients. Our Clients are the hungry in Hall County, Georgia that we serve. They are the elderly, the unemployed, the underemployed, the disabled, the homeless, and so many more of life's courageous. We enjoy making their lives a little easier by providing nutritious grocery items and household staples. We are an all-volunteer organization and we could not exist without the many services our volunteers provide every day. From picking up food supplies to inventory to stocking the shelves to delivery of our services, they are there. And, they are always there with a smile and a helping hand. Our volunteers are our inspiration! The pantry is staffed by members of Christ Lutheran Church, Oakwood First United Methodist Church, Saint Gabriel's Episcopal Church, First Baptist Church of Oakwood, McKever Road United Methodist Church,and Restoration Presbyterian Church. It is amazing every time one action of giving and sharing leads to more actions of giving and sharing. 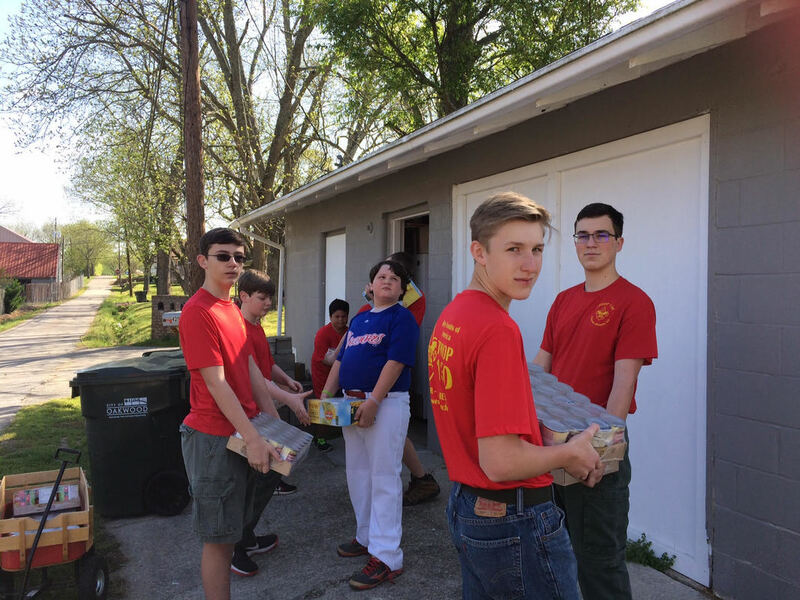 The Boy Scout Troop in Flowery Branch has volunteered many times at the pantry over the last 5-6 years. They grew older and younger scouts moved up to step in. Sometimes younger sisters came and always wanted to help. Now a Girl Scout herself, Jorja Powell has donated 48 boxes of cookies to be distributed by the pantry. We are so proud of these young people. Get Nutrition Tips and Tools for Your Home, Work, or Class. Feeding the hungry of Hall County, Georgia in body and spirit.